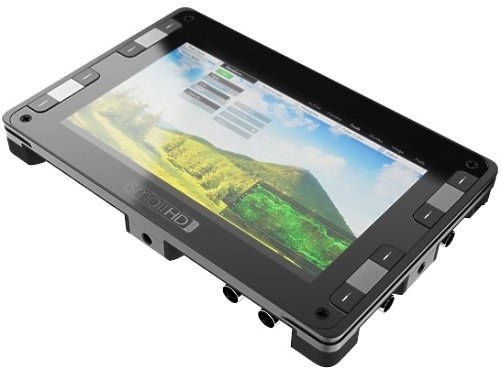 The DP7-PRO LCD-HB is a 7”, 1280x800 high resolution field monitor that uses an extra-bright LCD display giving a 1500 nits. As well as having preset LUTs the DP-7 Pro will detect almost all types of user-generated LUTs including 3 LUT file types, and you can view a graded image on-set or location during capture. Just save the settings to the included SD card and start viewing. The DP7-Pro has been designed with speed of operation in mind and has nearly all features assignable to a Smart Key, for quick switching between monitoring applications. 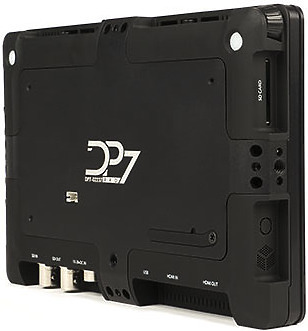 The DP7-Pro is flexible too, having on-board SDI-to-HDMI and HDMI-to-SDI conversion to help you meet equipment and client needs. The monitor is actually capable of handling HDMI to HDMI (Pass-through), SDI to SDI (Pass-through), SDI to HDMI, HDMI to SDI, HDMI to HDMI+SDI (Dual Output), and SDI to SDI+HDMI (Dual Output) signals. “X-Port” Expandability Port for both current and forthcoming accessories. Carries multiple simultaneous HD signals thus keeping your other external ports free. The DP7-PRO HIGH BRIGHT's daylight-viewable, true HD displays are specifically designed to outmatch the brightness of the sun on clear summer days by boosting the luminance rating over 1500 nits (3x a traditional LCD monitor). Matching the monitor’s brightness to the brightness of the scene means sun hoods are no longer necessary for finding critical focus, the monitor can be used on a Steadicam, multiple people can view the monitor at once, and overall eye-strain is reduced. The DP7-PRO HI-BRIGHT model only draw 24 watts—its high efficiency back-light LEDs provide major energy savings for the amount of illumination they provide. A high-resolution waveform monitor provides vital exposure date. The DP7-Pro’s Waveform feature can be re positioned around the screen. A large vectorscope gives a detailed view of the color balance in a shot. Gain may be increased to magnify the vectorscope, helping to keep your colors within safe broadcast limits. Keep your subject in razor-sharp focus with SmallHD's industry-leading Focus Assist feature. Selectable intensity, peaking color and your choice of full color or B&W background assure the focus plane is easily trackable from any viewing distance. Customizable IRE ranges, as well as other common industry standard scales built-in make setting exposure a fast and painless affair no matter which system you have experience with. 2x, 1.5x, 1.33x — However your image is squeezed, the DP7 can correct the image to appear at the correct aspect ratio. Aspect markers, crosshair, crosshatch and action safe lines help keep you from unintentionally framing your shot “artistically”. When displaying a 1080p signal, pixel zoom allows you to view the image at a 1:1 ratio, meaning you will see a 720p crop of your 1080p image. Whether you wish to convert an SDI signal to HDMI to have it looped to a television on-set or wish to convert an HDMI signal to SDI to improve your professional workflow, the DP7-PRO has you covered, all while retaining a full 1080P image down the line. A high-resolution waveform monitor provides vital exposure data and can be re-positioned around the screen and full-screened. Variants include luma & chroma, as well as individual red, green and blue channels. A large vectorscope (windowed or full-screen) gives a detailed view of the colour balance in a shot. Gain may be increased to magnify the vectorscope, helping to keep your colours within safe broadcast limits. Safely keep your image exposed properly with the windowed or full-screen histogram which helps you to know where the bulk of the image sits in the IRE range. When operating a steadicam it is common for the camera to begin to tilt without it being immediately obvious to the operator. Using the DP7-PRO’s accelerometer the horizon indicator is a great way to make sure you’re pointed right-side-up. Whether on a C-stand or mounted tight against the camera, the DP7-PRO has two identical scroll wheels in the top corners, making for an interface that can be intuitively operated by either hand at any time, plus 8 quick-access “Smart-Keys” located on the front for toggling any software feature you want.